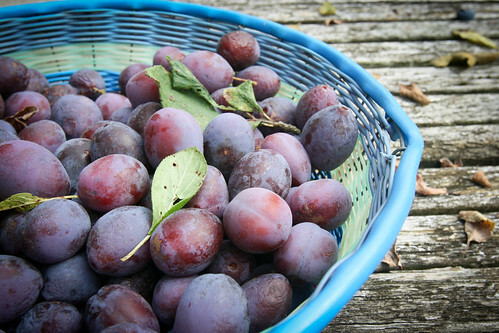 I have recently been the grateful recipient of a large quantity of Damson Plums thanks to the generosity of nature and my friend Gloria Nicol. Some of these plums have been turned into Damson Vodka, others were made into Gloria’s recipe for Dumpsideary Jam from her book 100 Jams, Jellies, Preserves and Pickles . 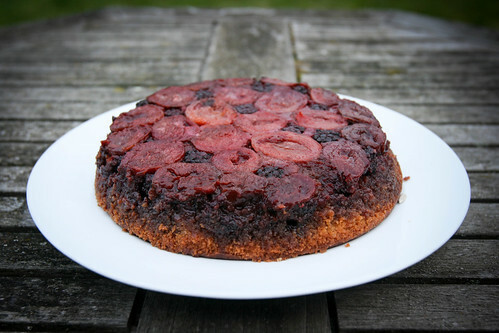 But the first thing I did was turn some of these plums – super soft, ripe and sweet – into a cake. I was inspired by my friend (and pastry chef) Kathy (aka stresscake) to go for an upside down cake. She did something very similar with her plums last August and aptly pointed out that a recipe like this will help you get through a pound and a half or so of plums in an extremely delicious way (very handy if you have a lot of plums to get through). Upside down cakes are really easy to make, but usually the reserve for pineapples (and if you’re going that route, Kathy’s got a classic Pineapple Upside Down Cake Recipe, too). 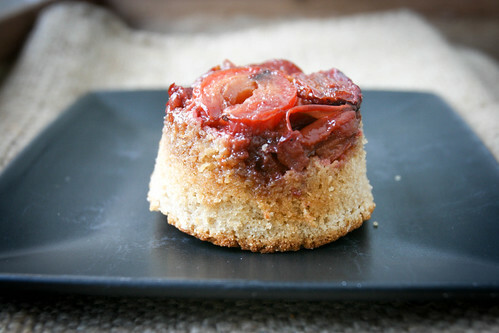 Plums offer a nice twist on this, with a hint of spice in the cake complimenting the autumnal plums. If you don’t have a cake pan that is large enough to fit all of the batter called for in this recipe, you can make smaller mini upside down cakes in ramekins which are really fun. 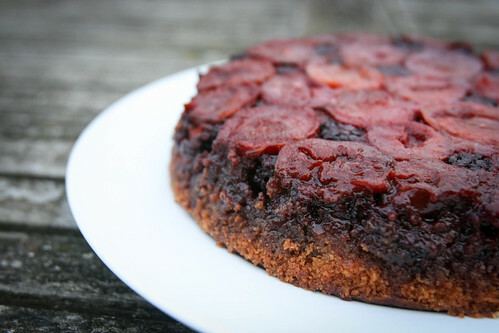 I really love this plum upside down cake served with creme fraiche or Greek yogurt, but vanilla ice cream or whipped cream would go equally well. Preheat oven to 180°C / 350°F. Put 4 Tbsp of butter in a 9-inch-diameter skillet or cake pan. Put the pan in the oven and leave it until the butter has melted. Remove the pan and swirl the butter around so its distributed evenly. Sprinkle over 3/4 cup of brown sugar. Lay the plums on top of the sugar in a single, tightly-packed layer, skin-side up. If you’d like, fill in any gaps with blackberries or blueberries. Now make the batter. Mix flour, baking powder, cinnamon and salt in medium bowl. Beat the remaining 6 Tbsp butter in large bowl with an electric mixer until light. Add sugar and beat until creamy. Add eggs and beat until light and fluffy. Beat in vanilla and almond extract. Add the milk and the dry ingredients to the mixture and mix with a spatula just until blended. Spoon batter evenly over plums. Bake until golden and a toothpick or knife inserted into the centre of the cake comes out clean (this will take about 50-60 minutes). Transfer to a wire rack; cool in the pan for at least 30 minutes. Using a knife, cut around the pan sides to loosen the cake. Place a plate on top of the cake pan then invert the cake. Let it stand with the pan still on for 5 minutes, then gently lift off the pan. Serve cake warm with whipped cream, creme fraiche or ice cream. Yeah!! Dang, I want this RIGHT now! 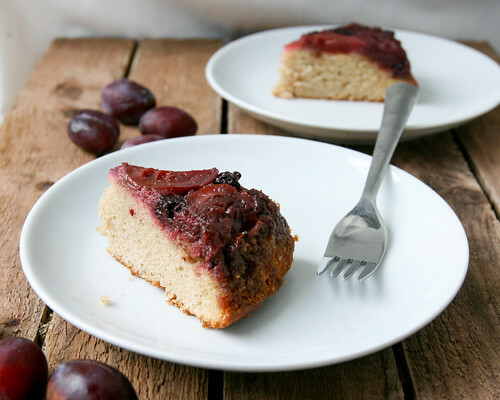 What a gorgeously decadent plum cake! Beautiful in ingredient and execution. I bet it tasted heavenly.